Using a Fathead coupon or Fathead promo code deal is a great way to score a giant wall decor for a cheap price. However, the best deals are usually in the Fathead clearance, where discounts of up to 90% off are possible. With ample choices of everything from Sci-Fi to sports, they have the home decor solutions for everyone from geeks to jocks. Fathead is renowned for its large, high definition wall graphics. Sports fans love their depictions of professional athletes, team helmets, and logos, but geeks respect even more their graphics of animated heroes and movie characters. The company has hundreds of officially licensed agreements with popular consumer brands from the NFL, MLB, NHL, and NASCAR to Warner Brothers, Lucasfilm, Marvel Characters, Disney, and Nickelodeon. Fathead’s graphics are made of durable vinyl with an adhesive backing that permits movement without damaging surfaces, so you can remove and reuse the decorations without harming your walls. 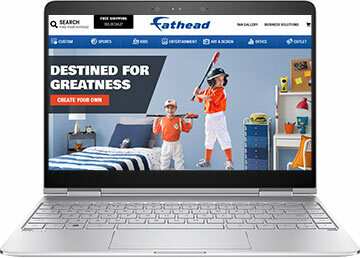 Fathead.com has twice been named among the hot 100 retail websites by Internet Retailer and won the Buzillions Reviewers’ Choice Award in 2010. In addition to their popular vinyl prints, www.fathead.com also retails heavy artist canvas that is saturated with color, stretched, and mounted as well as Xbox Live Avatars. You can create your own custom fathead design by uploading your own personal photo and selecting your size and other features. Your kids will love decorating their rooms with Fathead’s awesome array of super heroes, Transformers, Hello Kitty figures, and Disney and Nickelodeon characters. Grown-up kids might not mind decorating the game room, exercise room, or rec room with a few fatheads of their own. The website sells Halo fatheads, Star Wars fatheads, and popular movie star fatheads such as Bruce Lee, Chuck Norris, and Sylvester Stallone as Rocky Balboa. The Star Wars collection of wall graphics includes images of the Death Star, Yoda, Luke Skywalker, Darth Vader, C-3PO, R2D2, Darth Maul, Han Solo, Chewbacca, Princess Lei, and Obi-Wan Kenobi from the Clone Wars. How about a visually stunning fathead music poster or logo above your stereo system? They have Kid Rock, Kiss, John Lennon, Aerosmith, Ozzy Osborne, Coldplay, Deff Lepard, Genne Simons, and, for the daughter’s room, Jonas and Hannah Montana. Looking for something a little more refined? Fathead is a higher tech way to do home décor. Their art is modular, which means you can mix and match and hang it all without framing and without putting any holes in the wall. Just peel and stick your selection of any of Fathead’s many offerings of contemporary art, decorative art, modern masters, or old masters. They also have giant landscape and skyline murals. It’s the smart, easy way to decorate your home, apartment, dorm, or office with fine art. You can pick from a wide array of themes and sizes to suit your own unique style. Fathead has lots of other cool graphics: Barak Obama, Barett-Jackson Collector Cars, Harley Davidson, space exploration scenes, military images, model trains, and flags. They have kids and nursery graphics from letter and number sets to sea creatures, baby dinosaurs, and monster trucks. You don’t have enough time as is to tinker with your computer, so why hassle with hanging paintings when you can just slap up a visually appealing graphic from fathead.com?